Taken with my cellphone. 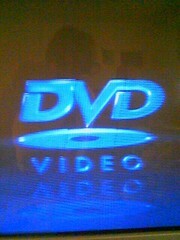 My DVD player shows this image when there’s no disc inserted. I used this image as the wallpaper on my cellphone and told people that my phone played DVDs. Which seems kind of weird since it’s no bigger than my palm.